We are Leading Manufacturers and Exporters of conveyor systems, we offer Belt Conveyors such as Flat Belt Conveyors, Rough Top Belt Conveyor, Slider Bed Belt Conveyor, Telescoping Boom Flat Belt Conveyor, Wire Mesh Belt Conveyor, Troughed Belt Conveyor and many more items. 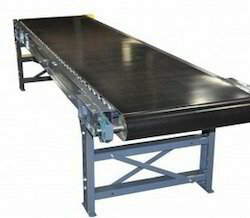 We have over 30 years of experience in design & manufacturing customized belt conveyor systems for various applications. Our ISO 9001:2008 systems certified workshop is fully equiped with fabrication equipments and is located in Noida (Delhi NCR). Rough Top Belt Conveyors are widely used to transport unit loads at various inclinations in various industries and production units. It is possible to effectively transfer loads without rollback by making use of these belts which have special textures for high grip of the loads. 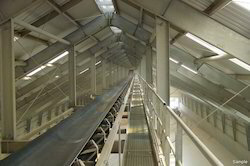 Our conveyors and designs are field proven and guaranteed for no roll back/slippage operation. The belt is double the thickness of normal PVC belt and better suited for heavy duty operations. We manufacture efficient Roller Belt Conveyors which find use in heavy duty conveying applications. The belt is supported on rollers and provides minimum friction conveying. This helps in reducing the power required by the conveyor while conveying heavy loads. 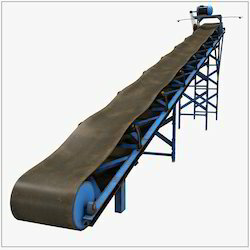 The belt conveyor can easily take impact loading at various points. The typical applications for these conveyors are for conveying bags, bales, bundles and other similar heavy loads. The Wire Mesh Belt Conveyor manufactured by us is offered in two variants - chain and sprocket driven and pulley driven. These are ideally suited to carry out efficient loading and thus, find usage in drying operations, painting, wet or oily applications and extreme temperature applications. We make use of high tech tools and machinery to engineer these products. Mesh Configurations: Offered in various mesh sizes and shapes. Structure: Available in constructions of M.S./S.S./Extruded Aluminum sections. 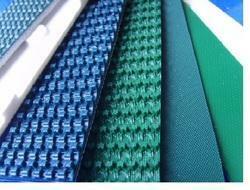 We design, manufacture and supply a wide range of Plastic Modular Belt Conveyor. These are designed and developed to suit the diverse requirements of different industries like chemical and food industries. 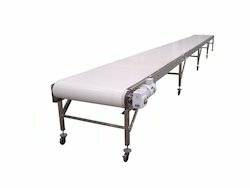 Therefore, these are hygeinic conveyors and are well suited for wet applications or wet cleaning for food applications. Some examples are meat conveying, tyre conveying, oven conveyor, steam cleaning applications, soap conveying, etc. These conveyors are particularly useful in conveying light & medium weight products over inclined distances. These Cleated Belt Conveyors are also well suited to irregular shaped products like ovals, rounds that have a tendency of relative motion to the conveyor belt. Useful in applications where the load is to be conveyed under controlled conditions. Can be used to convey loads over horizontal & inclined distances. Can be used in inclinations up to 40 degrees. Can be made into Z configuration conveyors. Cleats available in a variety of heights and thicknesses to suit different products. The cleats are durable as they are attached to the belt using an in-house proprietary method. The belt "work surface" can handle loads of almost any shape. 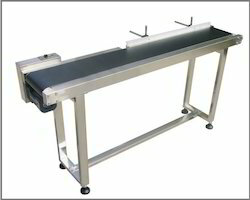 The belt "work surface" can also be used for process or production work. Our Trough Belt Conveyors are ideal for transferring bulk solids up to inclinations of 18 degrees. Built on reliable and efficient designs they are well suited to harsh operating conditions. Suitable for conveying bulk materials. Designed for use in dusty outdoor conditions. Ability to take vertical & horizontal bends. Can be used in inclination upto 18 degrees. Available in a wide variety of specialty belt grades for different requirements - SAR, M 24, N 17, HR, SHR, UHR 200, CMR, OR, FR, Hygenic . For conveying bulk solids such as - aggregate, limestone, cement, fly ash, sand, coal, etc. Undercarriage: Available in Mobile/fixed configurations. The mobility option can be further customized for manual mobility or powered mobility. 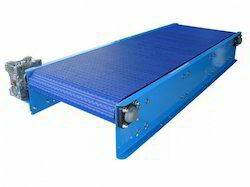 Flat Belt Conveyors are the most versatile and commonly used conveyors , custom made by us to fulfill the need of the application. 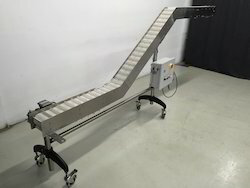 These conveyors can carry light & medium weight products of regular or irregular sizes. Please contact us for your requirement. This type of Slider Bed Conveyor is a low cost variant, which is highly useful in transporting small loads at shorter distances. 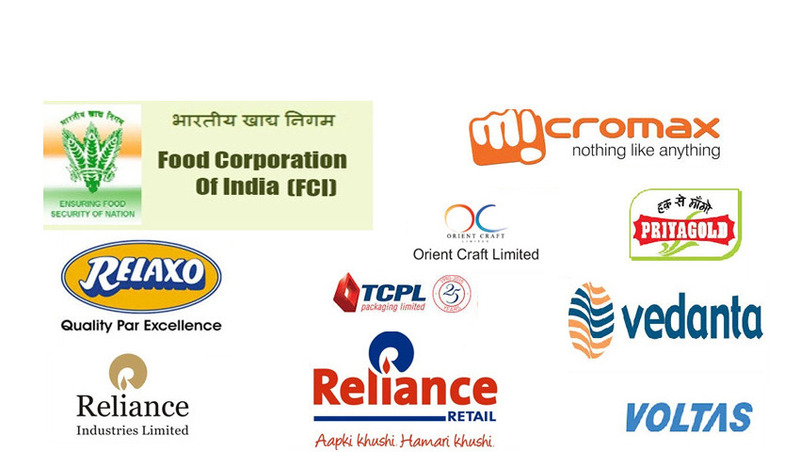 Further, these products are stringently quality tested by our team of experts and experienced quality controllers. For moving and carrying light & medium weight products of same/different sizes.